For a while, some Nigerians have been peddling rumors that the man in the state house at the moment is a cloned man and not President buhari that was sworn in in May 2015. The rumor mongers alleged that the person who is currently in the villa is a Sudan whose name is Jubril Aminu. Lol! 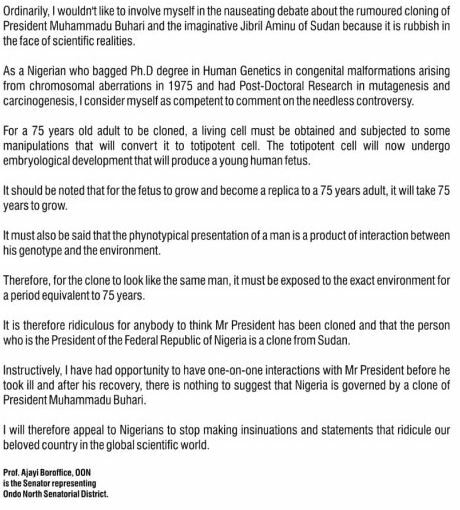 Senator Ajayi Boroffice who has a Ph.D in Human Genetics and currently represents Ondo North in the senate, on Monday released a statement, saying that there is no way in the world a 75-year-old man can be cloned. According to him, for a 75 year old man to be cloned, it would take another 75 years for his cloned body to become effective. Do You Believe President Buhari Was Cloned Too? ?